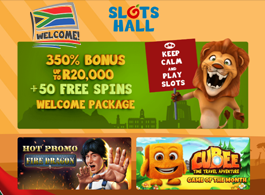 There are a number of high class online and mobile casinos for South African players and one of the newest and best around is Slots Hall Mobile Casino. This casino was launched in 2019 and is focused on South African players. The casino looks fantastic and has a great collection of games from Real Time Gaming (RTG). South African players can make payments in Rands (ZAR), while players from other countries can make payments in Euros (€). This mobile casino is compatible with the iOS, Android and Windows Phone mobile platforms. It is operated by Sea Gate NV and is licensed and regulated by the Government of Curacao through Gaming Curacao. You get an excellent selection of mobile slots and other games at this casino. The RTG software that powers SlotsHall mobile casino provides it with a number of excellent features. The interface is excellent and comes with responsive design thanks to the use of the latest technologies, including HTML5. The casino boasts of full HD graphics and superb animations and sound effects. Navigation is seamless and easy; you can swipe and tap your way to an amazing mobile casino experience here. The RTG software is available in instant play mode, which means you don’t have to download any casino app from the app store of your device to play at this casino. Just load the website on your mobile device’s browser, open an account – or log in if you already have one – and play the games available. The casino lobby looks slick and lists out the different categories of games available for you to play. The casino is known for offering secure and fair gaming. It uses some of the latest digital security technologies, including 128-bit SSL encryption and advanced firewalls, to protect your personal information and money. The Random Number Generator (RNG) at the casino is tested and certified for fair gaming and randomness by one of the best in the business – Technical Systems Testing (TST), a well-known testing agency that is nowadays part of Gaming Labs International (GLI). RTG is also associated with Central Disputes Systems (CDS), and this is great news for players as it gives them a third party to approach for mediation in case of disputes with the casino. Slots Hall Mobile Casino you get a good collection of games. These are not as exhaustive as the portfolio at the desktop casino: the mobile casino has about 120+ games compared to the 300+ at the desktop casino. However, they are of high quality and loaded with features that guarantee you a shot at some cool wins. Many of the slots, for instance, have progressive jackpots attached to them, and the fact that these are randomly triggered means you have every opportunity of winning one of them when you are playing them for real money. Most of the games at the casino are slots. You get different kinds of slots, from classic 3-reel slots to 5-reel and 6-reel video slots. The number of paylines varies greatly for the video slots, ranging from 15 to 50 usually. You can search for these games individually or on the basis of reels, jackpots, floating symbols or bonus rounds. Once you load a game for real money play, you can place your bets in Rands and click the spin button to get started. In case of progressive jackpots, you play them as you would at the desktop casino and are informed by the casino should you win one of them. Apart from mobile slots, you also get to play a bunch of table games that include a few variants of blackjack, roulette, and baccarat. There are specialty games as well and a good number of video poker games like Loose Deuces, Deuces Wild and Jacks or Better. The one game type you will not find at this casino is live dealer gaming. You can play at SlotsHall mobile casino from any smartphone or tablet that is running on the Android, iOS or Windows Phone mobile platform. This means you get a range of compatible devices including the iPhone (iPhone 4S, iPhone 5, and others right up to iPhone X), iPad (iPad 2, iPad 3rd generation and 4th generation and iPad Mini), 5th generation iPod Touch with the A5 Dual Core chip, Samsung Galaxy S3 and S4 right up to the Samsung Galaxy S10, Samsung Galaxy Tab 2 7 and Samsung Galaxy Tab 2 10.1, Google Nexus 4 and Google Nexus 7, Microsoft Lumia 550, 650 and 950 and others. The moment you open an account with SlotsHall mobile casino you get a no deposit bonus of R200. This bonus is available even before you deposit funds into your account. You can claim it using the coupon code SLOTS200. Once you have used up the no deposit bonus you get a superb welcome bonus package across your first 2 deposits, of up to R20,000 and 50 free spins. On your first deposit you get a 200% match bonus up to R10,000 and 20 free spins. You can claim this bonus using the coupon code WELCOME1. On your second deposit you get a 150% match bonus up to R10,000 and 30 free spins that you can claim with the coupon code WELCOME2. These bonuses come with a 20x wagering requirement; ensure you fulfil this condition to withdraw winnings earned with this bonus. The casino also has a superb range of bonuses for its existing players. There are daily bonuses as well as special bonuses on certain weekdays. These bonuses include free spins and deposit match bonuses and are available singly or in combination packages. You get deposit bonuses from 75% to 160%, and up to 50 free spins through these promotions. Visit the casino’s Promotions tab for detailed information about each of these promotions. At SlotsHall Casino Mobile you can make payments and withdrawals in the national currency of South Africa, the Rand (ZAR). If you are a non-South African player you can transact in Euros (€). All transactions at the casino are safe and secure. The mobile casino supports a wide range of locally popular methods. You can deposit using your Visa, MasterCard, Diners Club International or American Express credit card, or with a Visa debit card or Visa eVoucher. The casino also supports local payment methods like EasyEFT and EFTpay. Other payment methods supported include NETeller, Skrill, EcoPayz and Bitcoins. Deposits at the casino are instant, but withdrawals take slightly longer because of the detailed verification and authentication process. Withdrawals usually take up to 48 hours. You are required to use the same method for deposits and withdrawals. In case the deposit method you are using is not available for withdrawal the casino transfers funds to your bank account through bank transfer. The maximum withdrawal amount at this mobile casino is $10,000 a month. Any amount in excess of this number, including progressive jackpot payouts, is paid out at the rate of $10,000 a month. Slots Hall Mobile Casino is where you should be signed up if you are looking for a brand new casino that delivers a fabulous gaming experience. The casino is fun to be at and easy to navigate. The gaming environment is secure and you can place your wagers in Rands (ZAR). The game range is excellent and there are an amazing array of promotions for all. All of these make for a superb play experience, and that is the best reason for you to play at this casino.